A 1,800-year-old mosaic, which showed the sacrifice of Iphigenia, the daughter of Agamemnon and Clytemnestra during the Trojan War in Greek mythology, was found at excavation works in the ancient city of Perge in Turkey’s Mediterranean region. “We have found a 1,800-year-old mosaic that depicts the sacrifice of İphigenia during the Trojan War in the city of ancient Perge. This finding, which makes us quite excited, was unearthed when we were working to open a shop in the west wing. We have found out that this was a sacred cult area,” he said. Phigenia was the daughter of Agamemnon and Clytemnestra in Greek mythology. While the Greek army was preparing to set sail for Troy during the Trojan War, Agamemnon caused the anger of the goddess Artemis, because he killed a sacred deer. So, she decided to stop all winds, and the ships would not be able to sail. The seer Calchas realized what the problem was and informed Agamemnon that to appease the goddess, Agamemnon had to sacrifice Iphigenia to her. Reluctant at first, Agamemnon was forced to agree in the end. He lied to his daughter and his wife by saying that Iphigenia was to marry Achilles before they left. The mother and daughter happily went to the port of Aulis, only to find out the horrible truth. Achilles, unaware that his name was used in a lie, tried to prevent the sacrifice, but Iphigenia ultimately decided to sacrifice herself in honor and of her own volition. The most popular version of what happened afterwards is that in the moment of the sacrifice, the goddess Artemis substituted Iphigenia for a deer, but Calchas who was the only witness remained silent. Iphigenia was then brought by Artemis to the city of Tauris where she became the goddess’ priestess. 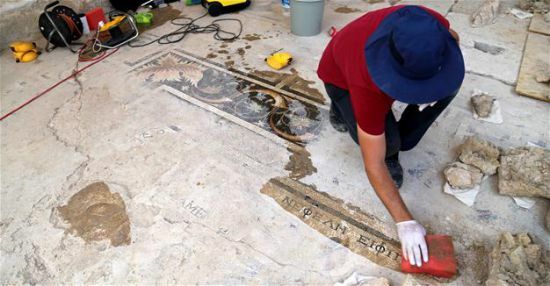 The ancient city of Perge has been dubbed as “Turkey’s second Zeugma” for the alluring appearance of the mosaics that have been unearthed so far. The city of Perge is situated 17 kilometers east of Antalya, within the borders of Aksu. The important monumental structures of the city have been excavated since 1946 and due to the excavated sculptures, the Antalya Museum has one of the richest collections of Roman sculptures.